Super Hero Boy: Now this carseat rocks! Ok, I'm as much of a car seat junkie as I am a stroller junkie and I think that has a lot to do with the fact that I've been obsessing over both since before Connor was born. The biggest and most important investment you can make as far as I'm concerned is in your child's car seat. After all a good car seat can actually mean the difference between life or death for your child in case of an accident and who wants to put that at risk? The Evenflo Symphony All In One Car seat delivers everything I've been asking for in a car seat at a price that's just down right unbelievable. I've had my eyes on a convert able car seat as long as I can remember (not mentioning names) that offered full side impact protection but lets just say it prices in at just about $300 and the Evenflo Symphony All In One Car Seat averages around $199 and its worth every single penny. Setting up the Evenflo Symphony All In One Car Seat was one of the most interesting experiences I've had thus far when it comes to car seats as usually I'm all about ripping things out of the boxes, installing, and going and rarely do I have to break out a manual but the straps that attach to the latch system threw me for a bit of a loop on this one. The Evenflo Symphony is genius as its latch attachment system is unlike anything I have even remotely seen before. First of all it offers some of the most heavy duty latch connectors I have ever seen, no frustrating little hooks that you can never get off one they are on, this car seat has totally push button latch connectors that allow you to not only easily just push and snap them in to connect the car seat but also release it with a push of a button. The thing that threw me however was the fact that the belts holding the latch connectors to the car seat are "seat belts" yes you heard me the same types of belts that you would see on your seat belt and instead of manually adjusting them by pulling on them with all of your might you just put some weight on the car seat, and the belts tighten and lock themselves just like a car seat if it got "locked". Seriously whoever thought this up, please direct me towards them so I can give them a huge kiss. The car seat itself offers full impact protection which as far as I'm concerned is one of the best features you can buy in a car seat. I can't even tell you how many kids came into the ER when I worked there with neck injuries and with unnecessary injuries even in small accidents due to the lack of side impact protection. Yes this feature not only adds a little size to your car seat and usually a bit to the price but it will pay for itself 1000 fold if you are ever in an accident. The Evenflo Symphony All In One Car Seat is just that... its a rear facing car seat for babies five to thirty five pounds, a forward facing car seat for children that meet the height requirements, and once your done with using a car seat together the Symphony All In One is also a booster seat. So before you balk at the $199 price tag that this car seat demands and laugh at me for telling you its its incredibly affordable take a moment to count up what it would cost you to buy an infant car seat, a forward facing car seat, and a booster seat. Even if you go the cheap route you will end up spending at least three times that price not to mention you wont even get half the features. The Symphony All In One has everything I've wanted in a car seat plus so much more including incredibly plush seats, a fully adjustable head rest that moves up and down at the push of a button (not just velcroed on! 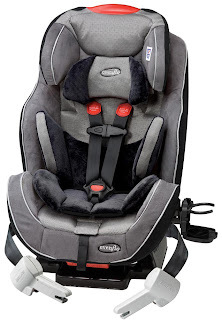 ), straps that can be adjusted without unthreading anything, heavy duty latch connectors, an auto adjusting tighten feature which I never even knew I wanted but wish all my car seats had now, and a recline feature when in use as an infant car seat. Really I'm not sure what else you could want. Really the only thing I would change if I could about it would be to have a more exciting choice of colors, I'd narrow down the latch connectors a bit as they are sort of tight to get in on a newer car though once you do it a few times it does get easier, and I'd make the cup holder a bit more sturdy. Overall its the best car seat we have seen thus far especially for the price seeing as it will take you from newborn to school I'm still totally blown away by it! You can read more about the Evenflo Symphony All In One car seat on the Evenflo website. You can also pick up one at several major retailers, see the where to buy section on the Evenflo site and check out the demo video while your over there!